Did you want to know how corporations can arm themselves with the knowledge and tools to be prepared for dealing with electronic discovery before litigation commences? 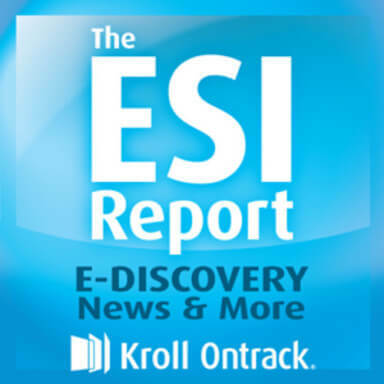 In this edition of The ESI Report, host Michele Lange, Attorney and Director of Legal Technologies at Kroll Ontrack, opens the ESI Buzz with experts, Patrick Oot, Director of Electronic Discovery and Senior Litigation Counsel at Verizon in Washington and Chris Wall, Manager with Kroll Ontrack’s Legal Technologies Consulting Group, to discuss this exciting topic. In the Bits & Bytes Legal Analysis segment, Gina Jytyla and Joni Shogren, Kroll Ontrack Staff Attorneys, focus on the facts surrounding Nursing Home Pension Fund v. Oracle Corp. Don’t miss it!